Downtown Tucson Partnership staffers worked to find housing for downtown homeless this year. Caroline Shive has experienced homelessness herself, so she had a special passion for helping other people living on the streets find shelter. As Old Pueblo Community Services' community engagement specialist, Shive helped 84 homeless individuals find homes. Shive would ride around in the Downtown Tucson Partnership Connects mobile unit on Mondays, reaching out to any people experiencing homelessness by giving them "blessing bags" with snacks and something to drink. Part of the mobile job was signing individuals up for housing, asking if they had access to food stamps and connecting them to a social service agency. Some of the areas she visited included Santa Rita Park, Catalina Park and Jacome Plaza. Shive faced homelessness six years ago, but she was able to get back on her feet by getting a job and an apartment for her children. Shive said approaching people experiencing homelessness with compassion and assistance is the best way to help, rather than incarceration. "I just learned that all these individuals need is for someone to treat them like human beings and help them find the best services for them in Tucson," Shive said. 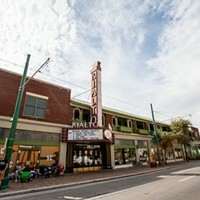 While Shive has since left the job, her work did not go unnoticed: The Downtown Tucson Partnership's DTP Connects program was recently recognized as one of the best in the country by the International Downtown Association, which awarded the local group with the Pinnacle Award, honoring the most creative and inspiring innovations in urban development worldwide. The Tucson Downtown Partnership teamed up with Old Pueblo Community Services about a year ago when roughly 90 to 104 people were living in Jacome Plaza, which caused the downtown park to temporarily close to address the issue, according to Downtown Tucson Partnership CEO Kathleen Eriksen. 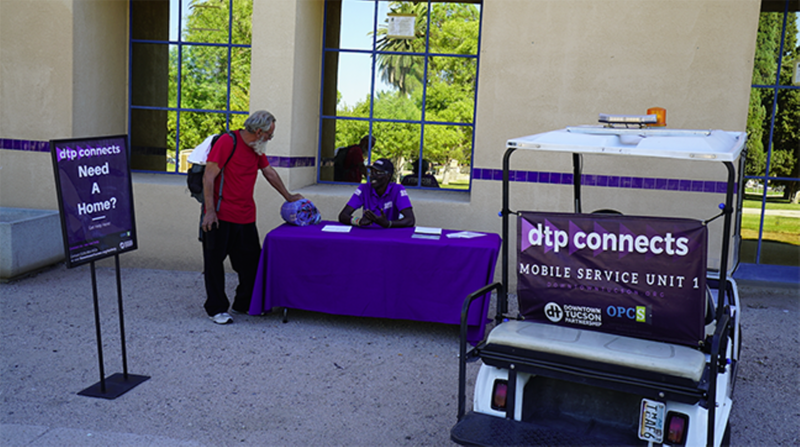 Within the first three months of the program, the efforts of Downtown Tucson Partnership and Old Pueblo helped 84 individuals find permanent homes, reducing the street homelessness population by 96 percent in Jacome Plaza, located outside the downtown library branch. Besides finding homes for seven dozen people, the effort reduced sanitation calls for human waste by 92 percent and security calls for violence and drug use by 96 percent, according to Allison Shashok, the communications manager for IDA. Eriksen said that people experiencing homelessness are susceptible to dying on the streets if they do not acquire permanent housing within 12 months. There are about 500 housing vouchers that go unused in Tucson every year, which could go towards housing the homeless, Eriksen said. The problem was a missing communication link between the people in need, the services and the housing that was available. "It is incredibly effective because we help bridge that connection," Eriksen said. "If for some reason an individual needed a few more steps in the process, misses a mandatory meeting, or lost their Social Security card, we get them to those meetings and we help them through that." Once the people experiencing homelessness are approved for assistance in housing, the agencies can sometimes have difficulties finding these people in town. DTP staffers can help locate them and connect them to a community service agency that can help with specific needs. Each person that is chronically homeless can cost Pima County anywhere between $65,000 and $100,000 dollars per year in medical and incarceration costs, according to Eriksen and Old Pueblo. She says the medical and incarceration costs can put a strain on community resources that could be better used towards housing the homeless. In a security survey conducted by the Downtown Tucson Partnership Merchant and Retail Council, the primary concern among downtown businesses was chronic street homelessness. Another survey of the Downtown Tucson Partnership Board determined that chronic homelessness was an issue holding the downtown back from future success, Eriksen said. Through the efforts of the DTP Connects program and of local social service agencies, Jacome Plaza located in the Downtown is now more accessible for park-goers and tourists. Eriksen said it went from zero park users to three new park users every day, with 75 percent of them being women and 53 percent are children. 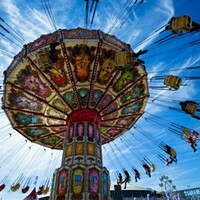 "If children and women are using the parks, then you know it's safe," said Eriksen. "Security and emergency calls have been reduced in the area, overall its opening up public parks where people had been living." DTP Connects works with the philosophy of compassion first and enforcement second, according to Eriksen. "We enforce the rules as far as our security and maintenance measures, but we start off with compassion by asking if they need shelter, water or food," said Eriksen. Old Pueblo Community Service's Housing First program helps individuals facing long-term homelessness find permanent housing in the community. The Housing First program accepts veterans and people with chronic illnesses or substance-abuse problems. Old Pueblo not only provides them housing but also connects individuals with health services. Brandi Champion, the supportive housing manager at Old Pueblo, helps place people experiencing homelessness into permanent homes. Champion said she has been working at Old Pueblo for nearly nine years and says the program has been successful since it started in 2016. The Housing First process connects individuals with a steady income by providing opportunities to jobs. After they have access to a job, only 30 percent of their income goes towards the rent of their housing. 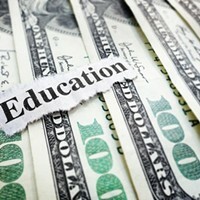 The program assists the individuals with their rent until they are self-reliant. "It's important that we get these people to the services they need," said Champion. "The No. 1 thing people should have is shelter and definitely regular meals. People are not disposable and the homeless are our more vulnerable people. Without these services they are forgotten." 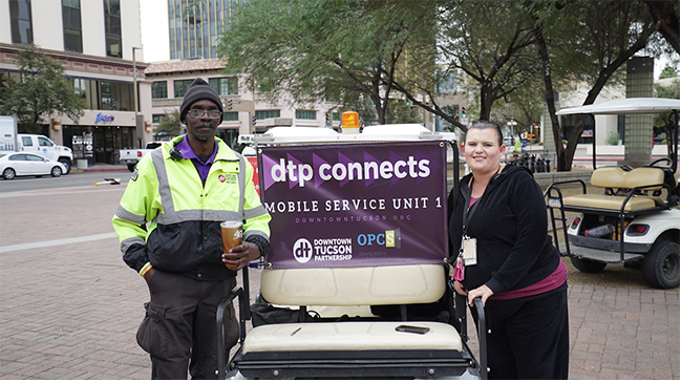 The Downtown Tucson Partnership also adopted the DTP Connects Mobile Unit, a golf cart vehicle that allowed community engagement specialists to go around town assisting the homeless with their specific needs. International Downtown Association President and CEO David Downey said the recipients of the Pinnacle Award provided innovative projects that set a new standard for improving cities. "Each award-winning project has made a demonstrable impact on its city and the people who live, work and play in the urban center," said Downey.